[impResp,t] = impz(sysobj) computes the impulse response of the filter System object™, sysobj, and returns the response in column vector impResp, and a vector of times (or sample intervals) in t, where t = [0 1 2 ...k-1]'. k is the number of filter coefficients. [impResp,t] = impz(sysobj,n) computes the impulse response at floor(n) 1-second intervals. The time vector t equals (0:floor(n)-1)'. [impResp,t] = impz(sysobj,n,fs) computes the impulse response at floor(n) 1/fs-second intervals. The time vector t equals (0:floor(n)-1)'/fs. [impResp,t] = impz(sysobj,,fs) computes the impulse response at k 1/fs-second intervals. k is the number of filter coefficients. The time vector t equals (0:k-1)'/fs. [impResp,t] = impz(sysobj,'Arithmetic',arithType) computes the impulse response based on the arithmetic specified in arithType, using either of the previous syntaxes. impz(sysobj) uses fvtool to plot the impulse response of the filter System object sysobj. You can use impz for both real and complex filters. When you omit the output arguments, impz plots only the real part of the impulse response. For more input options, refer to impz. Create a discrete-time filter for a fourth-order, lowpass elliptic filter with a cutoff frequency of 0.4 times the Nyquist frequency. Use a second-order sections structure to resist quantization errors. 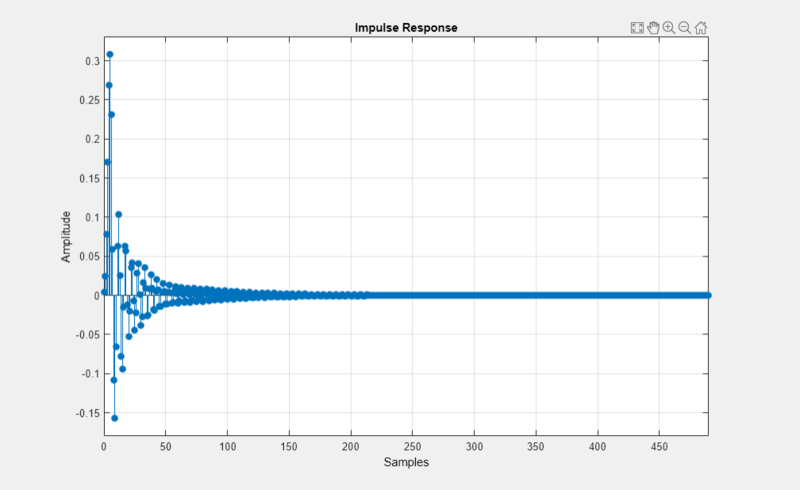 Plot the first 50 samples of the impulse response, along with the reference impulse response. Create a design object for the prototype filter. Use ellip to design a minimum order discrete-time biquad filter. Length of the impulse response vector, specified as a positive integer. Sampling frequency used in computing the impulse response, specified as a positive scalar. Impulse response, returned as an n-element vector. If n is not specified, the length of the impulse response vector equals the number of coefficients in the filter. Time vector of length n, in seconds. t consists of n equally spaced points in the range (0:floor(n)-1)'/fs. If n is not specified, the function uses the number of coefficients of the filter.